On this second anniversary of Dave Brubeck’s death, an animated cartoon from Russia is a reminder of the impact that his music has had in many, perhaps most, parts of the world. Occasional Rifftides Moscow correspondent Svetlana Ilicheva called it to my attention. The cartoon is a creation of the Russian artist Ivan Maximov. Its quirkiness and charm are typical of his work. Whether he captures the spirit of the Brubeck Quartet’s music may be up to the eye and ear of the beholder, but there is no question that Maximov takes a unique approach to illustrating the quartet’s best-known recording. 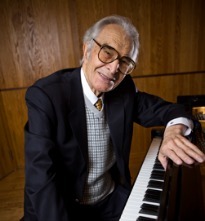 For the illustrated Rifftides report on Brubeck’s memorial service in May of 2013, go here. Thank you for remembering Dave, Doug. His music does still impact so many people life’s; for the wonderful body of music that he left for all of us to enjoy we should be eternally grateful. Dave said shortly after Paul Desmond died, “Boy, we sure do all miss Paul”. Well, all his fans will echo when I say – “Boy, we sure do all miss Dave”. Mr. Bolger operates the DaveBrubeckJazz.com website. Here’s a tribute to Brubeck that has a LIVE octet version of “Take Five” as its audio track. The cartoon is quite brilliant.